It's godofchaos, Sakuya wrote this before she left, so I'm posting it for her under her own name and stuff (just adding this here so people know she isn't back yet). I'm sure she will append any changes and add more tags when she returns. Dracomon is the most recent dragon/lizard Digimon released. In advertisements, he is given the title of "10th Anniversary Digimon," because he was revealed in the Digimon 10th Anniversary Event/Greatest of Digimon. He is a Child level with a Data attribute, and is a Pure Blooded Dragon type Digimon, which sets him apart from the other Dragon Digimon. In fact, he is also known as the ancestor of all Dramon Digimon. According to his profile, Dracomon is the ancestor of all Dramon-type Digimon. This is reflected in his name Draco, which is Latin for Dragon. While he is a Child level, he boasts superior strength and wit, and he is said to be in a top class level. However, even though he is a top class Child Digimon, he still has the typical Dragon's guilty pleasure of hording bright shiny objects. Also like Dragons, on his body he has only one scale that goes in the opposite direction, known as the Gekirin (lit: Reverse Scale). Just like any Dragon, if his Gekirin is touched, he would go berserk and attack indiscriminately. His attacks are, Baby Breath, Tail Smash, and Ji Shurunen (transliteration is currently unknown). Baby Breath might be a reference to Agumon's signature Baby Flame attack. Dracomon had much reception from Digimon fans after he was unveiled. He was in almost every Digimon website, both Japanese and English, and his thread on With the Will received, 98 replies (that's 7 pages), and 2056 views. However, there have been accusations by fans that Dracomon's evolutions and pre-evolutions aren't original at all. Many fans claim that Babydmon is actually Babydramon, a fan-made Digimon that won a contest and became official, however hasn't been released anywhere. There are also claims that Coredramon, and Groundramon are based on Earthdramon, another never-released Contest Digimon winner, who was meant to complement Airdramon*, and Seadramon. However, the only evidence for these claims are that their names are similar. In the past there have been similar theories, like D'arcmon being based on Generamon, or Toge Mogumon being based off of Hari Mogemon. 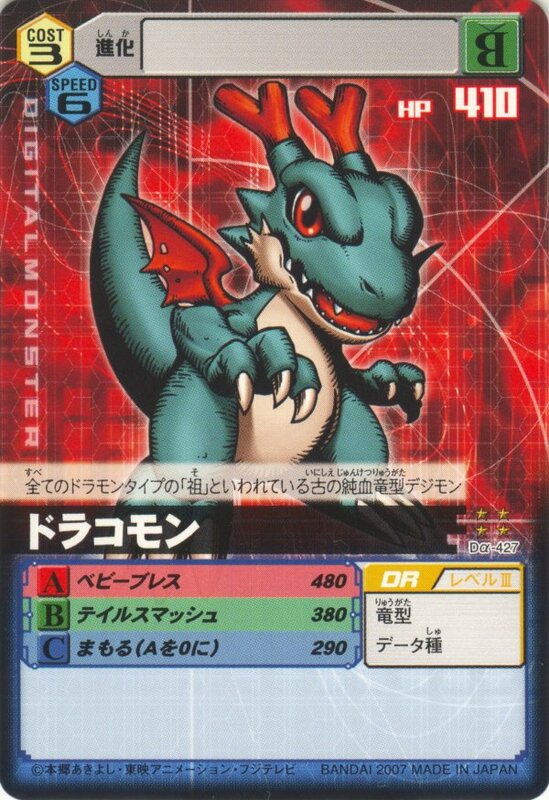 Dracomon and his evolved forms have so far only appeared in the Digimon Card Game. However it is known that Dracomon, Coredramon, as well as Groundramon will be playable in the upcoming DCD Digimon Battle Terminal 02. 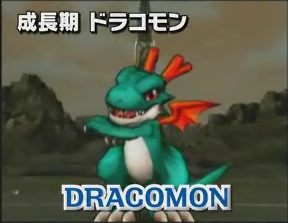 Dracomon's Adult form Coredramon was also revealed to have a blue variation, known as Coredramon Subspecies. Dracomon's Ultimate form has yet to be released, however one theory is that it is Huanglongmon (due to the presence of the Four Holy Beasts in Battle Terminal 02, and the Earth/Core themes in Dracomon's Evolution line). It is unknown what Dracomon's true purpose is, however he has definitely made a splash these past months. *When Dracomon was first revealed, it was speculated by fans that his "true Adult form" would be Airdramon, however this was dismissed after Coredramon was revealed.